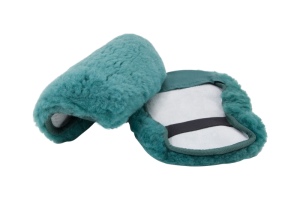 Shear Comfort Medical Sheepskin Footwear for Comfort & Protection. Soften the unforgiving parts of any wheelchair with high pile density Australian Medical Sheepskin. Shear Comfort Foot and Calf Plate Protectors bring comfort and protection to otherwise unforgiving parts of the wheelchair. Elastic straps hold the sheep’s wool pads in place, so you can enjoy extra protection and comfort in your wheelchair. This Shear Comfort product is machine washable in an approved Sheepskin Shampoo & Conditioner. 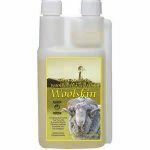 We recommend that you use Woolskin: Sheepskin Shampoo & Conditioner to clean and disinfect this Shear Comfort products Woolskin contains the natural fungicide and miticide..Tea Tree Oil, together with wool conditioning agents. Washing should occur regularly to remove skin and dust particles etc. Washing will also disinfect the wool and reduce the chances of infection of open wounds. Clean up any spillage with a damp cloth before washing. Use a Gentle or Wool cycle for slow limited agitation. This will reduce any felting of the wool. Shear comfort products can be dried in the dryer using low heat and gentle agitation. Do not over-dry since wool performs best with 15% residual moisture. Best care would be to Air- Dry. Products will last longer if not exposed to heat.